The curvaceous Panton Chair by Danish designer Verner Panton continues our alphabetical list of iconic seating designs for the run up to Christmas. Verner Panton's sculptural seat has graced the cover of Vogue and was the first chair to be manufactured completely out of a single piece of plastic, according to its manufacturer Vitra. Panton's self-titled chair is curved to follow the form of the sitter's body, giving it the early name S Chair. The Danish designer first sketched his idea for a stackable chair in the 1950s, and an initial plaster-cast model was made by manufacturer Dansk Akrylteknik in 1960. Panton and Swiss furniture brand Vitra encountered each other in 1963 and the two parties went on to develop the design for the chair, which was finally presented in Danish design magazine Mobilia in 1967 – shortly before it went into serial production. They created a cold-pressed model using polyester strengthened with fibreglass, but the heavy material was later swapped for a lighter and cheaper thermoplastic polystyrene for mass production. Production halted in 1979 when the durability of the polystyrene was questioned, but a new version now known as the Panton Chair Classic made from rigid polyurethane foam was later launched by Vitra. It is still available with a glossy lacquer finish in black, red or white. In 1970, the chair appeared in British fashion magazine Nova as part of a sequence illustrating "how to undress in front of your husband". Model Kate Moss was photographed naked on the seat for the cover of a 1995 issue of Vogue, leading The Independent to name it "officially the sexiest chair ever made". 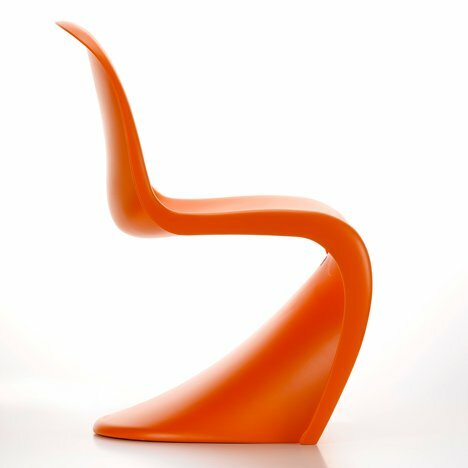 Vitra released another version of the chair in 1999, which it now calls the Panton Chair. This latest design is produced in dyed-through polypropylene, with a matte finish that comes in six different colours. One of the earliest models features in the permanent collection of New York's Museum of Modern Art (MoMA), and editions are owned by London's Design Museum, Berlin's German Historical Museum and Copenhagen's Danish Museum of Art and Design. Designer Peter Jakubik carved the rough shape of the iconic chair into a tree trunk with a chainsaw in 2011 and design student Matthias Brandmaier spent three days in the woods creating a replica with similar tools and materials in 2013.